Yes, yes I know. I bet you all thought I fell off the face of the earth. Nope, I'm still here. Just seem to be busy. Yet I can't for the life of me tell you what I've been busy doing. I'm not trying to be mysterious, I just can't seem to figure out where the time went. I'm still chasing the Wee Ones, (sigh) still. I still have the ever satisfying and thrilling job of cleaning in the mornings. I have temporarily set my knitting aside. Ummm I think that's it. I do promise to come back really soon with some photos of some of the things I've been working on. Maybe tomorrow I'll break out the ol' digital camera and snap some shots. yep you read correctly. Monsters. And en masse as well. One evening this little creature popped into my imagination begging to be created. And not wishing to offend I decided to grant it's wish. It started off with one simple one. Doesn't it always? The middle Wee One claimed it as soon as he saw it half finished. The the smallest Wee One decided he wanted a "Monder"( his rendition of the word). So off I went to create another. The next thing you knew the middle Wee One, be the giving sort he is, asked The Boy if he wanted a monster. So the monsters became three. But as you can see being such jolly, happy and fun loving beings they invited two more of there friends to join in the frivolity. The last two that came along will be making a trip to stay with my nephew and my father. My father is currently in hospital and so that monster will be busy cheering him up. I have heard wee whispers that there are two more monsters that will soon be making an appearance. Those two monsters already have there instructions on what they will be doing when they get here. They are such curious and busy little creatures, but lovely to be with. a zipper on someone else's jacket was so fascinating? straws could be made into everything from swords, to belts, to headgear? an empty cardboard box was more interesting than all your toys in the toy box? being told to pick up all your toys and only picking up a couple was good enough? eating your boogers was your idea of a snack? wearing socks, especially when one might be too small or just wearing one was acceptable to you? finding the front of your underwear or pants was a mystery? you could get all sorts of loves and hugs when you stubbed your toe or skinned your knee? the word "yellow" was a tongue twister? eating all the food on your plate garnered you a "Good job"? asking the same question over and over and over again was your idea of a good strategy to get the answer you want? every door or curtain in your house was the opportunity for adventure? the food on someone else's plate was far more interesting than the food on your own plate? your nap time seemed to be your parents favorite time of day? So how is it going for all of you so far? Any amazing and wondrous things occurring? Not so much for me today. Actually I have felt kind of jittery all day. Like when you drink way to much strong coffee way to fast. Yeah that feeling. I hate that when that happens. I have a hard time settling to anything. And I have a few too many things to settle to. I have my first quilt to finish, my second quilt top to finish piecing, my small project I mentioned here earlier to finish. 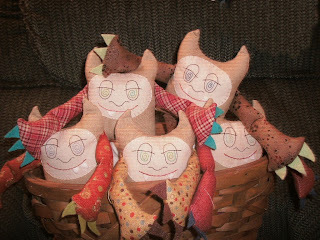 I have 6 projects to work on and complete in order to send off to family. And I have one sewing pattern to try and another sewing pattern to create. As well as three projects to complete. Sigh. So you see I have enough to to keep me busy and occupied. Yet I can't seem to get into any of them. There are several things praying on my mind that I can't seem to get rid of or let go of. (please excuse my dangling participle) One of those things is the possible move we are talking about making this year. Now that this year is officially here I seem to be panicking about the logistics of a move. Mostly because of the state of the economy right now. Right now I have my wee job that works out perfectly for my family. It does not bring in that much money but something is definitely better than nothing. We live in a rent controlled apartment, as much as it is way too small for our family. It is a blessing to have a roof over our heads. And as much as I really dislike living in this area, still. Now it's just an ember of dislike as opposed to a little while ago when it was a a blazing inferno of displeasure. So I sit here trying to ignore the nagging jitters and focus on something... anything. So hopefully the start of your new year has been more hopeful and less agitated.